The station is housed in the former Lambriadio School building in Ano Pedina, Zagori. 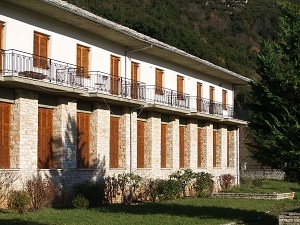 The Lambriadio school of weaving began operation in 1933 and provided public education for about 1000 girls from Zagori and the wider area of Epirus. The current building housed the school from the end of the ‘70s until it closed in 2007. The building is a two-storey building with a total area of about 1400m2. 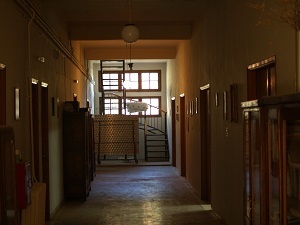 On the lower floor there are five large halls (which used to house the looms and equipment of the weaving school). These have now been converted into a lecture hall for 100 people and two smaller theatres for teaching and labs. 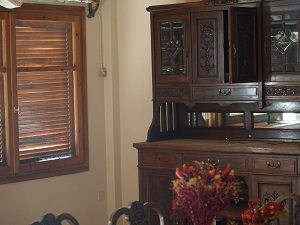 The lower floor also has a kitchen and dining area and offices. 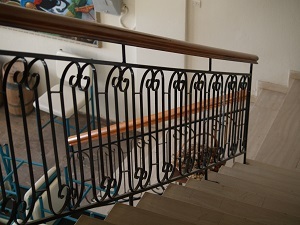 The first floor contains five dormitory areas (for 8 persons each) as well as five smaller guest rooms (four singles and one double). The building also has a large courtyard and garden with a surrounding wall. Ioannis Lambriadis was born in 1821 in Upper Soudena (now Ano Pedina). He traveled to the city Braila, Romania, where he built up considerable wealth in the timber trade. Later he moved to Corfu, where he died in 1889. In his will, he gave instructions for the establishment of the Housekeeping School for financially disadvantaged girls in his hometown in Zagori. This, however, did not open until 1933 due to legal complications. The school taught carpet making, weaving, embroidery and tailoring as well as courses for general education. In 1979 the school moved to its modern building and continued to operate until 2006, when it was closed due to the diminishing population. In 2012 the Administrative board of the School signed a protocol of cooperation with the University of Ioannina, granting the use of the building by the University in order to create the University of Ioannina Lambriadios Research Station (today: PALASE Field Research Station).